Designs lighting for corporate events and theatre. Lighting designer and automated lighting programmer. Lighting Design for theatre, concert production, business theatre, industrial design, and film. Lighting design for concerts, corporate shows, and touring. Information includes reviews, portfolio, and contact details. official magazine of the european lighting designers association and the international association of lighting designers. past issues and ordering. Automated lighting programming and lighting design for concerts, corporate events, and television. Lighting design and consultation for exhibition lighting, corporate events, museum installations and theatre. Portfolio of theater design. Includes images of lighting design, architecture, and photography. Theatre consultants providing lighting design, audio systems design, and audio/visual systems design. Providing southern New England with theatrical production services such as lighting design, equipment rentals and sales, sound design, scenic artists, electricians and show crews. Portal for lighting professionals with searchable listings of vendors, discussion forum and lighting industry news. Resource for professionals in the field of lighting. Site features a comprehensive list of websites about lighting. Reviewing LED lighting in contemporary art and design. Lighting Design Portfolio of Michael Mahlum. The site contains his work from Theatre, Opera, Musicals and Dance as well as some Sound and Set Design work. Student designers portfolio with galleries detailing scenic and lighting design. Provides lighting design for theatre, dance, and concerts. It features online portfolios of designers associated with TAM. Lighting Design for Theater, Dance, Opera, Events, and Private Functions based in The Bay Area/Los Angeles . Web site of the international lighting designer. Includes biography, design portfolio and contact details. Lighting design for theatre, dance, concerts, trade-shows, corporate, and industrial events. A compilation of past and current projects and services of this Orlando, FL based entertainment lighting design firm. Lighting design for Theater, Film, Architecture, and Special Events. Includes project photographs and video. Provides design, programming, and consulting services for live events from theater to rock concerts to trade shows. Professional lighting design for theatre, dance, opera and commercial projects. Images, credits and contact information. If the business hours of Blue Hill Design in may vary on holidays like Valentine’s Day, Washington’s Birthday, St. Patrick’s Day, Easter, Easter eve and Mother’s day. We display standard opening hours and price ranges in our profile site. We recommend to check out bluehilldesign.com/ for further information. 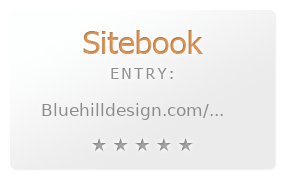 You can also search for Alternatives for bluehilldesign.com/ on our Review Site Sitebook.org All trademarks are the property of their respective owners. If we should delete this entry, please send us a short E-Mail.